THE EDITOR The secret of business is to know something that nobody else knows. - Aristotle Onassis If Aristotle was still around today, observing the culture of West Texas and our reaction to recent events, he would probably say we have proved the meaning of this insight he shared many decades ago. It’s amazing to see how resourceful our community is when they are put to the test in times of struggle. That’s a lot of what you’ll read about in this issue of PBE: people who see opportunity in the middle of the storm and a chance to take a risk when others are playing it safe. You’ll hear about a couple local business owners who decided to branch out on their own right in the midst of the uncertain climate we’re currently in because they seem to know something that others don’t. They share the secret to their confidence and results of the leap of faith they’ve taken. You’ll also get an update on one of the many unique offerings in our West Texas community through the completion of Xcor’s new spaceport at Midland International Airport. In this month’s safety tips, the experts at American Safety also give you an overview of things to look out for as you’re using or starting a new company to make sure you getting or receiving the high quality our community is known for. Along with the updates from around our state, nation and world, make sure you also take time to be inspired by Pastor Daniel Stephens and learn about a wonderful local non-profit celebrating an important milestone of success. Since no one really knows how long these lower than desired oil prices are going to last, why not try to make the best of a rough time and look for as much untapped and unknown opportunity as possible. AARON CAMPBEL American Safety Services, Inc. 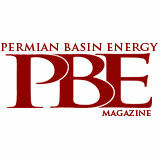 Copyright © 2015 Permian Basin Energy, Inc. • Mad Ads Media All rights reserved. Reproduction in whole or in part without the written permission of PBE MAGAZINE, LLC is strictly forbidden. The greatest care has been taken to ensure the accuracy of information in this magazine at time of going to press, but we accept no responsibility for omissions or errors. 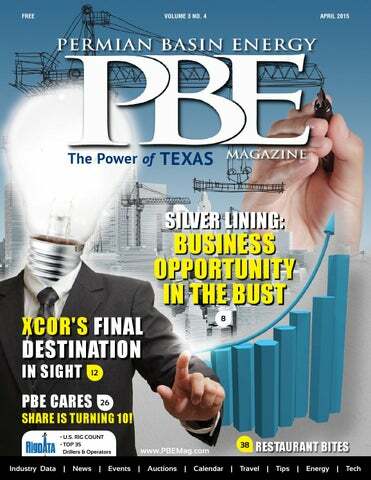 PBE Magazine welcomes any comments, feedback, suggestions, and/or submissions for consideration for publication. These may be submitted to: sales@pbemag.com. KIMBERLY SMITH CEO Development Resources, Inc.
was always a long term objective but with the boom it just came sooner than expected and they all agree it was worth it. Michael Johnson said, “Waking up in the morning and coming to work at a company with your name on it is a totally different feeling.” An area in the industry that the founders of H&J Petroleum feel can be lacking in the oil and gas industry is education. A way for them to sincerely stand by their commitment to education is to offer an education and training program to their contractors free of charge. What better way to achieve excellence than to increase the skills of your contractors by taking matters into your own hands? Another local employee turned entrepreneur is Greg Moore of Basin Design Service LLC. Like H&J Petroleum, Moore credits his success to his faith. When asked, “Who would start a business at $45 a barrel?” His response was, “God would!” Unlike the other companies, going independent wasn’t a deliberate move. It took over six months to obtain the Master Service Agreement required to provide his services to the major oil company he works with. As an electrical designer, 90 to 95 percent of his job is done in the office working with engineers. They service tank batteries, salt-water disposals, compressor stations, gas plants, basically anything electrical. The bust has also worked in Moore’s advantage because with everyone less busy, help is easier to find and equipment is a little cheaper. But like the rest of us he’s looking forward to things picking back up again. For now he says he’s going to “trust in the Lord to keep it going the right way and try to be smart enough to ride out the bust so we can enjoy it when it’s booming again.” The oil industry is no stranger to innovation and entrepreneurship; we’re always striving for efficiency and while we’re used to seeing new businesses coming out of the woodwork during the busy times, the reasons for starting up during a recession are even more advantageous. When asked about his timing to go out on his own, Matt Hood quoted 18thcentury British nobleman Rothschild, “The time to buy is when there is blood in the streets.” The Permian Basin is bleeding right now so it must be time to buy. Members Only Event - TBA Networking Reception Day Two (May 7, 2015) Industry Trends, Employer Updates, Legislative Affairs, Economic Forecast, and MORE! INTERESTED IN SPONSORSHIP? WTxEC has something for everybody. To learn more about supporting our work in West Texas and the benefits to your company or organization, contact Katherine Stokes, Executive Director katherine@wtxec.org and 325-669-2769. FINAL DESTINATION, IN SIGHT It’s a feat that’s been two and a half years in the making and the reality of the Tall City becoming more suitably known as Space City is closing in. XCOR Aerospace Inc. announced its intentions to move their company headquarters to Midland, TX on July 9, 2012.
a company that develops and manufactures space suits, recently broke ground on its new facility at Spaceport Business Park. Their facility will include Midland Altitude Chamber Complex, a suit testing and evaluation chamber. The University of Texas of the Permian Basin has also expressed interest in implementing an aerospace engineering program to accompany the potentially new local economic environment. recently XCOR appointed Jay Gibson, formerly of BeechcraftCorporation, as their new CEO. His predecessor, Jeff Greason, was appointed as Chief Technology Officer. The transition will allow time for Jeff Greason to focus on the Lynx Program. Both Mr. Gibson and Mr. Greason have already purchased real estate in Midland and are looking forward to living here in our friendly atmosphere - when they’re not traveling outside of the Earth’s atmosphere. Sponsored by United Nation’s World Health Organization (WHO), World Health Day focuses upon a different health theme each year. It is an international event to emphasize and work on important health issues or problems. Many countries around the world participate. 9AM-12PM. 801 N. Loop 250 W. Midland, TX. The 2015 Autism SHARE Walk will be held at Grande Communications Stadium beginning at 9:00am! Join us in supporting children with all special needs and their families! Tons of family fun to be had including: bouncers, dancing, resource fair, rolling video games, therapy horses, and much more! Through this active professional association, we receive peer support, and support a number of charities and scholarships. In 2014, we gave $71,000.00 to local charities and scholarships. Mineral owners probably know that leases can be assigned and that the landman you are working with may not be the land manager through the life of a lease. Therefore, your lease negotiations are important. Within a three year lease, life happens, people change jobs, and companies change. 1) We are working with the actual mineral, royalty and surface owners 2) We trust the company or team we are representing 3) When we make you a lease offer, the company will pay the lease bonus 4) We trust the geologist who has worked hard to identify potential zones or acreage 5) The division order analyst will help credit your royalty payments fairly 6) Negotiated surface damages will be paid 7) The company will be a prudent operator and make efforts to clean up roads, surfaces, etc. Prudent landmanagers follow the ethics of the American Association of Petroleum Landmen. The Permian Basin Landmanâ&#x20AC;&#x2122;s Association has an active group of 1,400 current (active and associate) members. Some meet monthly for continuing education and networking. FESTIVALS AND EVENTS IN TEXAS All across Texas, a variety of festivals, events and attractions are a great way to have fun and to spend time with your family. RUN FOR GOD - BEGINNER'S RUNNING PROGRAM NOW THROUGH April 23 First Presbyterian Church, Midland, Texas 79701. 12PM - 1PM. Ever wanted to run a 5k, but didn't know where to start or were just scared? This is the place for you. We will learn about running together and will progress through 14 weeks of instruction, culminating with the Run For Babies 5k on April 25, 2015.
required training for almost every industry. It is important to remember that OSHA merely sets a minimum baseline of expectation and customers or specific jobs may require more than the minimum. Consulting with a professional in the industry will help identify which training is mandatory or optional. New hire training is an example of basic entry level coursesproviding the student with a broad range of topic proficiencies. Alternately, training in confined space entry is more job and industry specific and may not be necessary for all business models. American Safety Services welcomes the opportunity to review and develop ongoing safety training benchmarks maintaining compliance for both customers and their employees. 3) Inspections Frequent and documented equipment and records inspection is important and cannot be overlooked. Routine and daily inspections of everything from assets to personnel are markers for success. Although this process can be tedious and seem unimportant, ramifications from improper inspections can lead to catastrophic results. Scheduling monthly fire extinguisher inspections is an example of a life-saving tool that if left unchecked could be useless in the event of a fire. By performing regular audits and equipment checks, businesses and employees can avoid compliance failures with government and industry laws while also creating a cultural awareness within the organization that results in a safety first environment. Making safety a priority at every level is and should be the goal for every organization. Aaron Campbel American Safety Services, Inc.
LOVE their careers. It is truly their passion and a major part of their lives. I know why they do it all....for our families. They do it because they care about us. They do it because we matter. They want all families like ours to have this wonderful resource and support system.” SHARE provides all services to our families at no cost. We have two fundraisers each year, the Shooter’s that SHARE Clay Shoot, hosted by Concho each July, and coming up this month, the Autism SHARE Walk. The Walk began six years ago, drawing a crowd of 300, and this past year the Walk drew over 2,200 friends, family members and others wanting to show their support, raise awareness, and celebrate. On April 25th the Walk will take place at Scharbauer Sports Complex. There is something for everyone, including a resource fair, and a children’s area, complete with therapy horses, face painting, bouncers, and more. This year Coca-Cola and Albertson’s have teamed up and are donating the food to have a cook-out after the Walk. All proceeds will benefit SHARE and the families they serve. For more info visit www.spc.convio/autismsharewalk 5514 Champions Drive, Midland, TX Day-of Registration opens at 8:30am Opening Ceremonies begin at 9:00am Autism SHARE Walk steps off at 10:00am All proceeds will stay local to help our family and friends with special needs here in the Permian Basin. people use these platforms to consume Netflix and other digital media. The household is bigger than just the guy who bought the PlayStation." Vue streams live, on-demand and DVR TV over the Internet. The company has an iPad application in the works. PlayStation gaming consoles are among the most common devices used to stream video from the Internet to a TV. Sony has an installed base of 35 million PlayStations, PS3 and PS4 combined, in the US. Myers said Vue will add more device support "in the mobile space and the TV-connected space," referring to handhelds and other boxes along the lines of a Roku or Chromecast, without specifying devices. Though Vue is limited for now to New York, Chicago and Philadelphia, he said Sony will add more US cities later this year. Vue's collection of channels is a mix of local and regional networks, broadcast staples and cable options. It includes broadcasters CBS, NBC and Fox, as well as many of those companies related channels, such as Fox's Fox News and NBCUniversal's Bravo and SyFy. It also includes networks from Discovery, Scripps, Turner and Viacom. AMC channels -including the namesake network that is home to "The Walking Dead," television's top-rated scripted series -- will be added to the service next month. to compensate for having fewer channels than cable for not much less money, when the cost of Internet service is added. Myers said that the way Vue serves up TV will make customers feel like they're getting more than they did before because of features that make it easier to find and get what they like to watch. "There's been a lot of great TV made recently, and a lot of great TV in general, that people can't find. It's about the mechanism by which you can make it available," he said. "How can you make it more about what I want to watch and less about what's on at that given time?" PlayStation Vue is Sony's response to that question. But Vue raises another: Will people pay top dollar for it? And that's a plot -- borrowing from the land of TV -- that is to be continued. FALLING RIG COUNTS DRIVE PROJECTED NEAR-TERM OIL PRODUCTION DECLINE IN 3 KEY U.S. REGIONS EIA's most recent Drilling Productivity Report (DPR) indicates a change in the crude oil production growth patterns in three key oil producing regions: the Eagle Ford, Niobrara, and Bakken. The DPR estimates, which were issued on March 9 and cover the months of March and April, include the first projected declines in crude oil production in these regions since publication of the DPR began in October 2013. However, with production gains continuing in other regions, particularly the Permian, overall crude oil production in regions tracked by the DPR rose slightly in March to 5.6 million barrels per day. Total production in the DPR regions in April is expected to be virtually unchanged from its March level. In any given month, there are new wells and legacy, or continuing, wells. Production from legacy wells declines over time, but recently the rate of decline in some regions has been increasing. This means that, in order for overall production to increase, operators must drill enough new wells to overcome the decline from legacy wells. As fewer wells are drilled, this decline becomes a significant challenge to overcome. U.S. SHALE OIL FIRMS BRACE FOR MORE PAIN AS CRUDE RESUMES SLIDE With the prospect of another plunge in crude prices looming after two months of stability, U.S. shale oil producers may face another round of spending cuts to conserve cash and survive the downturn. A deeper retrenchment would have far-reaching effects. Additional cutbacks would further gut the alreadyhemorrhaging oilfield services industry and may heighten expectations for a steeper drop in U.S. crude output later this year. They would also reinforce the United States' emerging role as the world's "swing producer," with dozens of independent companies that can quickly ramp up production in good times and dial it back in a downturn. "If I were an oil company today, I would talk about one thing: how far can you cut costs," said Fadel Gheit, an oil analyst at Oppenheimer in New York. "They cannot control anything else." Gheit said he expected a new wave of capital budget cuts starting in May, when much of the energy industry reports quarterly results. U.S. oil companies have slashed spending 20 to 60 percent since the price of oil fell by half from June to January, and oilfield services firms shed more than 30,000 jobs, according to Reuters compilations of public disclosures. earnings in May, though ConocoPhillips (COP.N) has already announced cuts on Tuesday. Conoco said it expected to spend about $11.5 billion per year over the next three years, down from a prior forecast of $16 billion. Oil producers can save money by shrinking their rig fleets and delaying so-called completions, which include fracking, of wells to bring them online, which accounts for 60 to 70 percent of a well's total cost. Anadarko expects to end this year with 420 to 440 uncompleted wells, while EOG Resources Inc (EOG.N), often considered the strongest U.S. shale oil company, expects to have 285, with postponed completions saving it about $500 million. OUTPUT DIP? The U.S. land rig count has already fallen some 43 percent from its 2014 high of 1,876 in November to 1,069 in March, according to Baker Hughes. More declines are likely. That trend, along with deferred completions, has some executives predicting national crude output will drop earlier than official forecasts. Debt rating agency Moody's estimates that about a fifth of the North American exploration and production companies it follows will slash budgets by more than 60 percent this year while more than half will cut spending by at least 40 percent. The Energy Information Administration (EIA) latest forecast from March 10 sees U.S. output peaking in May at 9.46 million barrels per day (bpd) and then dipping to 9.41 million in June. But in a sign the drop could come sooner, the agency now expects output in two of the biggest U.S. fields, the Eagle Ford shale in Texas and the Bakken in North Dakota, to fall in April, for the first time since it began tracking drilling in those oilfields in 2013. After a pause brought a sense of relief, the price slide resumed in March as U.S. benchmark West Texas Intermediate (WTI) fell 12 percent in one week to $42 on concerns about lingering global oversupply. Citibank and Goldman Sachs have said oil could tumble to $30 or even $20. Still, those initial declines, projected at around 18,000 bpd, would make only a small dent in global oversupply estimated at about 1 million bpd. Some analysts say that as soon as prices inch up companies may quickly bring their backlog of wells online, limiting any possible price gains. One Houston banker said acquisition chatter has picked up in the past two weeks but that no company wanted to be the first to seek buyers given potential investors and sellers remain wide apart on valuations. Companies have made clear they will not hesitate to trim more to avoid credit rating downgrades and further stock sell offs. In the Bakken, for example, there are 800 uncompleted wells, state officials said. The tally is growing as producers wait to see if low prices trigger a roughly $5 billion North Dakota production tax break in June, said Lynn Helms, the state's top oil regulator. While oil producers brace for more cuts, they have not given up hopes for a rebound and assure investors they will be ready to tap uncompleted wells and boost the number of rigs they operate. BRITAIN HANDS LIFELINE TO NORTH SEA OIL INDUSTRY WITH TAX CUTS Britain announced in March a series of oil tax cuts and the creation of an investment allowance, heeding calls for help from battered North Sea oil and gas companies juggling high costs and a price slump. percent, introduce an allowance aimed at reinvigorating investments and, in a surprise move, reduce extra charges imposed on the North Sea's oldest fields to 35 from 50 percent from 2016. The changes are a shot in the arm for Britain's North Sea, where oil production has fallen to the lowest level since fields started pumping fossil fuels in the mid-1970s and fresh investments have stalled dramatically. "It's clear to me that the fall in the oil price poses a pressing danger to the future of our North Sea industry - unless we take bold and immediate action," Osborne told parliament in his annual budget speech. how so many of their friends and family offered their time, skills and energy to make sure they succeeded. "My daughter Viviana was a hairstylist in Odessa when we called her about opening the restaurant. She originally decided to leave her job for 2 weeks to come help us get started. 3 years later, she finally felt like we were in a good enough place for her to go back to the life she left in Odessa. The fact that she sacrificed so much for 3 years to help us out, was priceless." All the hard work and sacrifice definitely paid off as locals and out of town travelers alike fill Taco OJ’s parking lot on a regular basis. All the menus items are homemade and made fresh straight from his wife’s personal recipes. Since it is her restaurant, it’s fitting that the name also comes from her hometown of Ojinaga, Mexico. Most popular dishes are the Tacos OJ made with beef fajita meat and the Molcajet which is a meat dish featuring beef, chicken, shrimp and sausage with Aida’s special ground salsa. Daniel Stephens is the Senior Pastor of MidCities Community Church, since 2006. He is the honored husband to Kayla Stephens, a proud father of twin sons Jonah & Jude, daughter Kampbell and youngest daughter Karis Anna. was the man sleeping in the stern of the ship. “Don’t you care if we drown?” they asked. The man got up from his nap, commanded the winds to be quiet and still… and the wind and waves obeyed his voice! Then he looked at his friends and asked “Why are you afraid?” “ Do you not have any faith?” As I read this story to my daughter I realized something. Jesus, the man asleep in the story, was with his friends through the entire storm. He was available, accessible, and powerful enough to use the same voice that created the wind to calm it. And Yet… It wasn’t until his friends had exhausted their own strength and ability. It wasn’t until they lathered everyone up into a tizzy of frustration because they expected Him to wake up and do something of his own initiative. It wasn’t until they were at the end of their rope… that they went to Jesus. Pense Brothers Drilling Company, Inc.
Robinson Drilling of Texas, Ltd.
35 out of 100 operators based on their footage drilled. Keep track of the most active operators with details on their number of well starts. COLD WINTER WEATHER INCREASES NORTHEAST DISTILLATE DEMAND, BUT CONDITIONS ARE MODERATING The Northeast is experiencing a colder-than-normal winter. Population-weighted temperatures from October through February were 11% colder than the National Oceanic and Atmospheric Administration (NOAA) projected at the start of the heating season, 10% colder than the 10-year average, and 1% colder than last winter. The cold weather increased demand for both distillate fuel and natural gas for residential and commercial space heating. As natural gas demand for space heating increased, the natural gas supply infrastructure reached its limits and could not provide enough natural gas to meet overall demand, which also includes commercial, industrial and power generation uses. One result was the curtailment of natural gas supplies to interruptible customers, who are mostly industrial users and electric generators, who responded to curtailments by increasing their own use of distillate fuel. Some customers also switched voluntarily from natural gas to distillate as natural gas prices spiked above distillate fuel prices. spot price of ultra-low-sulfur diesel fuel (ULSD) to increase by $0.35 per gallon (gal) between January 23 and February 23, on top of a $0.31/gal increase attributable to the rise in the price of crude oil over the same period. As of February 23, the price of ULSD was $2.31/gal. As temperatures moderated and operations normalized along the petroleum supply chain, prices have since fallen. As of March 17, the price of ULSD in NYH was $1.71/gal (Figure 1). More than 80% of the homes in the United States that rely primarily on heating oil for space heating are in the Northeast. As a result, cold weather has a greater impact on distillate demand in the Northeast than in other regions of the country. However, over the past several years, that impact has become less pronounced as consumers have turned to other sources of energy for space heating. Since 2010 the number of Northeast households that use heating oil as the primary space heating fuel has declined by 16%, reducing the cold weather distillate demand response in the Northeast (Figure 2). the winter, imports increased to meet demand and barrels from Canada, Europe, and Russia resupplied the region. The most recent inventory data as of March 18 show distillate stocks have stabilized. Natural gas customers with interruptible service are no longer being curtailed by constrained pipelines, reducing their demand for distillate fuel, and natural gas prices have fallen back below distillate prices, eliminating the market incentive for switching to distillate. Recent weather forecasts also suggest the harsh winter weather is ending. As temperatures continue to moderate, the distillate supply situation in the Northeast should continue to improve. The U.S. average retail price for regular gasoline decreased three cents from last week, to $2.45 per gallon as of March 16, 2015, $1.09 per gallon lower than the same time last year. The only increase in price occurred in the Rocky Mountain region, up six cents to $2.29 per gallon. The West Coast price was down seven cents, to $3.12 per gallon. The Midwest price decreased five cents to $2.29 per gallon. The East Coast price fell two cents to $2.40 per gallon, and the Gulf Coast price was down a penny to $2.22 per gallon. The U.S. average price for diesel fuel decreased three cents from the week prior to $2.92 per gallon, down $1.09 per gallon from the same time last year. The Midwest, Gulf Coast, and West Coast prices each fell three cents to $2.82 per gallon, $2.76 per gallon, and $3.06 per gallon, respectively. The East Coast price decreased two cents to $3.08 per gallon. The Rocky Mountain price increased one cent, to $2.81 per gallon. PROPANE INVENTORIES GAIN U.S. propane stocks increased by 0.5 million barrels last week to 54.3 million barrels as of March 13, 2015, 28.0 million barrels (106.9%) higher than a year ago. Gulf Coast inventories increased by 1.3 million barrels and East Coast inventories increased by 0.1 million barrels. Midwest inventories decreased by 0.8 million barrels, while Rocky Mountain/West Coast inventories were unchanged. Propylene non-fuel-use inventories represented 8.5% of total propane inventories.